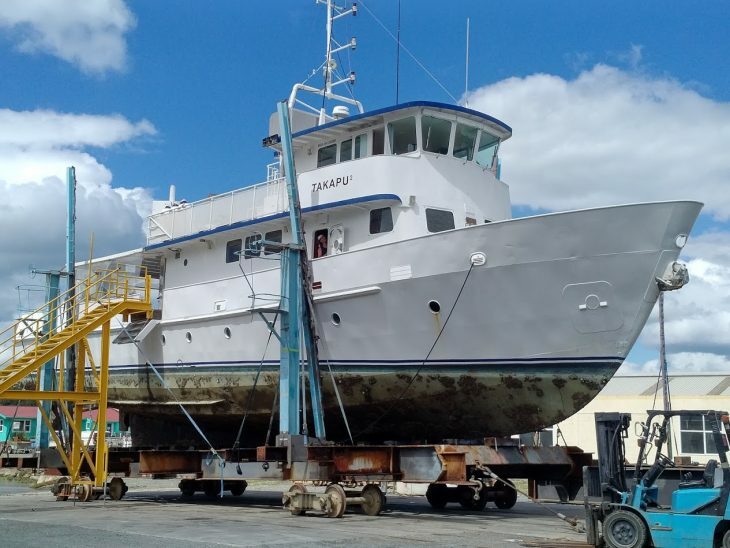 The ex NZ Navy survey vessel Takapu 2 returned to Oceania Marine’s North Shipyard, recently, which was where she was constructed in 1980. The shipyard was then owned by WECO which at the time was New Zealand’s largest shipbuilder. Some of Oceania Marine’s older tradesmen were then serving their apprenticeships in the yard. During her service in the Navy the vessel was well known around the coast of New Zealand as she undertook survey and patrol duties. Takapu 2 is now in private ownership as a luxury yacht and was hauled out onto the hardstand at North Shipyard for a 3 week refit. The main task was to remove existing underwater paint and apply new protective coatings but shaft, engineering and electrical works were also completed.